Flow cytometry is a technique for analyzing a large population of fluorescently labeled cells in a fluid stream. As the particles pass through a focused light source the amount of light scattered and the emission of a fluorescence label can be measured. Flow cytometry is a very important tool in basic research for investigating many aspects of cell functions and has emerged as a very important clinical technique in the areas of blood cells and cancer diagnostics. Why consider Semrock filters for your flow cytometer? 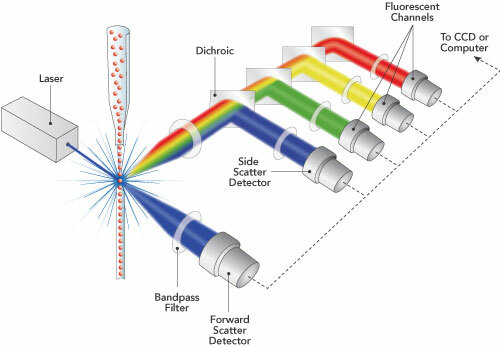 With the trend in high-performance flow cytometers is moving toward multiple lasers and huge numbers of detection channels at both visible and near-IR wavelengths, having the right optical filters is essential to discriminating between more fluorophores more completely. Semrock optical filters have the highest transmission of any filters on the market, which means you can achieve better sensitivity. Our outstanding selection of laser clean-up filters allows you the option of an ultra-narrow bandpass for gas or DPSS lasers or wider bandpass filters for systems with either multiple lasers at similar wavelengths or diode or optically pumped semiconductor lasers whose output can vary appreciably from laser to laser, with temperature or as they age. Semrock emission filters provide exceptional laser-line blocking (OD>6) to ensure no laser light reaches the photomultiplier tubes dedicated to precious signal photons and are optimized to eliminate crosstalk between popular fluorophores.